Parking as with Dowel Cave. Once opposite the farm look for the hidden (not hard to find but not obvious) path over the stream that leads to the cave. 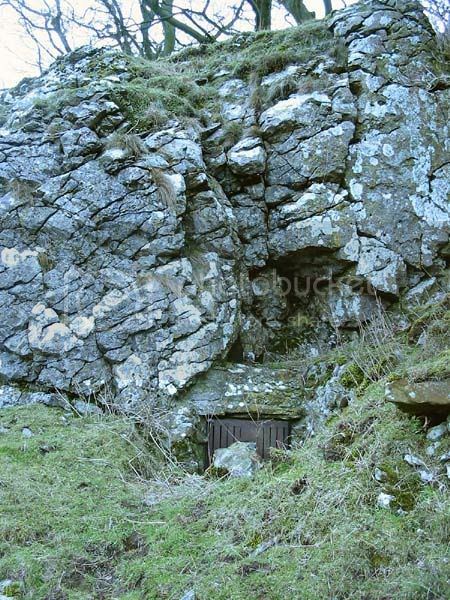 The cave is at the base of the crags in front of you once round the first buttress. The cave was excavated between 1958-1963 and finds included; three pieces of worked flint, sherds of a Bronze Age collared urn, some sherds described as earlier in date, two worked antler fragments in association with some animal bones, a range of faunal remains including bear, reindeer, hare and cat, and a bone point of possible Upper Palaeolithic date.